A renewable-energy (RE) developer on Tuesday said government investment policies should prioritize the development and construction of mini-hydropower projects, which, it said, are the most environment-friendly energy sources. "We believe that there is a need to give greater importance and priority to small-scale hydropower projects. Energy producers share a common commitment to the potential and the need for rapid growth in the development of clean, efficient and low-risk energy solutions," Victor Lee, Repower Energy Development Corp. (REDC) CFO, said. Noting that the small hydropower sector is primarily driven by private investment, Lee highlighted the potential of mini-hydropower, and the steps should be taken to attract more investments in the small hydropower sector from public investors. "With today’s improvements in technology, we can easily foresee turbines lasting for 100 years," Lee said. He added that financing mini-hydropower projects normally entails 70 percent to 80 percent in debt and 20 percent to 30 percent through equity; while there is also nonrecourse project financing available through government-owned-and-controlled banks, where a grace period on principal repayments during construction period is given. His company, REDC, a subsidiary of Pure Energy Holdings Corp., has already broken ground on three mini-hydropower projects, one of which is the recently acquired oldest operating mini-hydropower plant of Philippine Power and Development Co. that stood since 1927. REDC’s upgrade is expected to have a 200-percent increase in nameplate power capacity and an 800-percent increase in the energy-generation output. "Our run-of-river mini-hydro development projects all have service contracts with the Department of Energy [DOE] for 25 years, which may be extended for another 25 years. This could potentially last for 50 years, which is very attractive for investment," he added. Lee further noted that the incentive scheme for the sector is more attractive involving single-window clearances for such projects, including sites, clearances, survey and investigation of such projects to interested developers. However, he also noted that the development of small hydropower infrastructure in the country has been less than satisfactory, and that there’s a need to expedite huge untapped potential of the infrastructure at a faster pace to meet the unmet energy demands of the country, as well as to balance clean energy with fossil fuel- generated energy. "Our small-scale infrastructure investment in the country is not enough. REDC has strong project management, engineering and construction capabilities, and we can deploy capital rapidly to deliver high-quality mini-hydro assets to support the sustainable development of the country. We’re ready to provide this technology to the public," Lee said. Some sectors are showing signs of interest in small hydropower investments, he added, due to a feed-in tariff system and the government’s desire to cultivate its renewable sector and achieve its commitment in the 2015 United Nations Climate Change Conference. A finance expert in clean energy generation said the Philippines had great investment potential in mini-hydroelectric power projects and has called for more support and investments in renewable energy projects. At the 3rd Annual Power & Electricity World Philippines Conference, Victor Lee, CFO of Repower Energy Development Corp. (REDC), called on fellow investors to give priority to mini-hydropower projects. Investors are showing signs of more interest in small hydropower investments in the country, Lee said, due to a feed-in tariff (FIT) system and the government’s desire to cultivate its renewable sector and achieve its commitment in the 2015 United Nations Climate Change Conference or COP21. In July 2012, the ERC approved FIT rates for run-of-river hydro (P5.90 per kilowatt-hour or kWh) for an installation target of 250 megawatts (MW), biomass (P6.63/kWh) for 250 MW, solar (P9.68/kWh) for 50 MW and wind (P8.53/kWh) for 200 MW. His company, REDC, a subsidiary of Pure Energy Holdings Corp., has broken ground on three mini-hydropower projects, one of which is the recently acquired oldest operating mini hydropower plant of Philippine Power & Development Co. (Philpodeco) that has stood since 1927. REDC’s upgrade is expected to result in a 200-percent increase in nominal power capacity and 800-percent increase in the energy generation output. "Our run of river mini hydro development projects all have service contracts with the Department of Energy (DOE) for 25 years which may be extended for another 25 years. This could potentially last for 50 years which is very attractive for investment," he said. Lee said the incentive scheme for the sector was more attractive, involving single window clearances for such projects including sites, clearances, survey, and investigation of such projects to interested developers. Renewable energy developer Repower Energy Development Corp. (REDC) said the country can get more investments in mini-hydropower projects if the government partners with the private sector to boost interest in this power source. "We believe there is a need to give greater importance and priority to small-scale hydropower projects… With today’s improvements in technology, we can easily foresee turbines lasting for 100 years," said Victor Lee, chief financial officer of REDC. Lee added since the Philippines has lots of water resources, it should invest in renewables particularly in mini-hydropower projects, where current developments are primarily driven by the private sector, presenting an opportunity as well for public investors. "Financing mini-hydropower projects normally entail70 to 80 percent in debt and 20 to 30 percent through equity. There is also non-recourse project financing available through government-owned and-controlled banks where a grace period on principal repayments during construction period is given," Lee said. Based on industry standards, the cost of developing small-scale hydro project is at P4 million per megawatt (MW). "Our run of river mini-hydro development projects all have service contracts with the Department of Energy (DOE) for 25 years which may be extended for another 25 years. This could potentially last for 50 years which is very attractive for investment," Lee said. The company also commended government’s feed-in-tariff incentive scheme, which alsoinvolves single window clearances for sites and clearances, survey and investigation of renewable energy projects for interested developers. At present, aside from priority dispatch in the electricity spot market, run-of-river hydroplants enjoy a fixed rate of P5.90 per kilowatt hour. SMALL hydroelectric power projects in the Philippines are viable investments for the private sector because of their long-term service contracts, but support is needed from regulators to hasten their development, an official of Repower Energy Development Corp. said. "Our run-of-river mini-hydro development projects all have service contracts with the Department of Energy (DoE) for 25 years which may be extended for another 25 years. This could potentially last for 50 years which is very attractive for investment," said Victor J. Lee, Repower’s chief financial officer, in a statement. The extended contracts compares favorably against the long asset life of hydropower technology, with turbines lasting for a hundred years with the improvement in technology, he said. Financing mini-hydropower projects normally requires a 70%-80% in debt and 20%-30% equity, Mr. Lee said, adding that government financial institutions now offer non-recourse funding where a grace period on principal repayments is given during the construction period. Non-recourse loans are attractive for investors as the lender is entitled only to repayment from the profits of the project that the loan is funding. But Mr. Lee said the development of small hydropower infrastructure had been "less than satisfactory," adding that there was a need to tap its potential sooner, to fulfill unmet energy demands while striking a balance between clean energy and fossil fuel-generated energy. "We believe that there is a need to give greater importance and priority to small-scale hydropower projects. Energy producers share a common commitment to the potential and the need for rapid growth in the development of clean, efficient, and low-risk energy solutions," he said. Mr. Lee said an incentive scheme for the sector would be more attractive for interested developers with single-window clearances for the various phases of the project. Repower, a subsidiary of Pure Energy Holdings Corp., has broken ground on three mini-hydropower projects, one of which was recently acquired from Philippine Power and Development Co. The mini-hydropower plant is said to be the country’s oldest operating facility, dating back to 1927. After an upgrade, the plant is expected to have a 200% increase in nameplate power capacity and an 800% increase in the energy generation output, the company said. MINI-HYDROPOWER projects must have priority in terms of investment support to meet the country’s need for clean power, according to Repower Energy Development Corp. (REDC). "We believe that there is a need to give greater importance and priority to small-scale hydropower projects. Energy producers share a common commitment to the potential and the need for rapid growth in the development of clean, efficient, and low-risk energy solutions," Victor Lee, chief financial officer of REDC said. The statement comes on the heels of plans by the Department of Energy (DOE) plan to legislate a fuel mix-policy and set aside current incentives in favor of the development of renewable energy source under Republic Act (RA) 9513 or the Renewable Energy Act of 2008. Because the Philippines is blessed with water resources, Lee said Filipinos should maximize and invest in renewables since there is a sustainable and long-term development potential in mini-hydropower projects. "With today’s improvements in technology, we can easily foresee turbines lasting for 100 years," said Lee, noting the long-term asset life of hydropower technology. Financing mini-hydropower projects normally entails 70 to 80 percent debt and 20-30 percent equity. There is also project financing available through government-owned and -controlled banks, with a grace period on principal repayments during the construction stage. REDC, a subsidiary of Pure Energy Holdings Corporation, has broken ground for three mini-hydropower projects, one of which is the oldest operating facility of the Philippine Power & Development Company (Philpodeco) that started in 1927. "Our run-of-river mini-hydro development projects… have service contracts with the DOE for 25 years, which may be extended for another 25 years. This could potentially last for 50 years which is . . . attractive for investment," Lee noted. The incentive scheme for the sector involves single-window clearances for sites, clearing, survey, and due diligence. However, Lee noted the development of small hydropower infrastructure has been less than satisfactory. There’s a need to hasten the development of untapped potential for the power infrastructure to meet the demand and to create a balance between clean energy and fossil fuel power plants. "Our small-scale infrastructure investment in the country is not enough. REDC has strong project management, engineering, and construction capabilities and we can deploy capital rapidly to deliver high-quality mini-hydro assets to support the sustainable development of the country. We’re ready to provide this technology to the public," said Lee. Some sectors are getting interested in investment in small hydropower due to the feed-in tariff (FIT) system and the government’s desire to cultivate its renewable sector and achieve its commitment in the 2015 United Nations Climate Change Conference or COP21, Lee added. 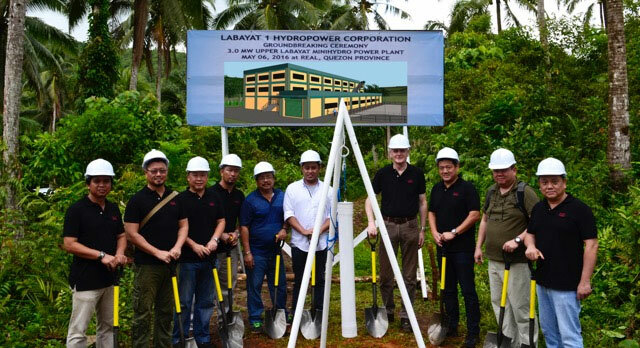 THE Repower Energy Development Corp. (REDC), the mini hydropower business of local investment holding company Pure Energy Holdings Corp. (PEHC), broke ground for a run-of-river hydropower-plant project in Upper Labayat, Quezon Province. 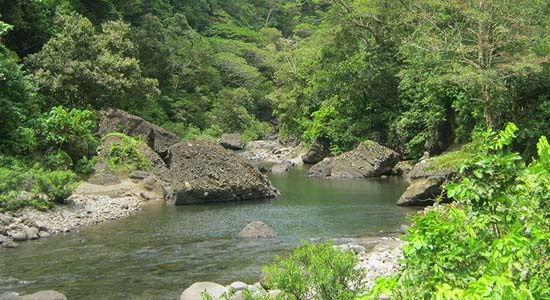 The hydro facility will be built in the upper cascade of the Labayat River, while the power station itself will be built at Barangay Maragondon, Municipality of Real, Quezon. With an installed capacity of 3 megawatts (MW), the power plant will generate over 16 gigawatt (GWh) of clean and renewable energy annually, which is equivalent to the consumption of around 20,000 households. This makes the Upper Labayat mini hydropower plant one of the most efficient power plants constructed by REDC. The high-pressure hydropower plant station will use water from the Upper Labayat river stream and produce power for the local community. The plant is scheduled to begin its operations in the fourth quarter of 2018, after a construction period of about two years. Upon completion, the power plant is expected to last for 100 years and will be the first mini hydropower project in Quezon province. REDC currently has five more mini-hydropower projects in Quezon alone that are in the pipeline, and will break ground on its second Quezon project next month. "This is one of the projects that we're building to benefit the local community as we will provide clean, reliable, and sustainable energy. This project will directly address the province's overdependence on coal power plants as its primary energy source," said Dexter Y. Tiu, REDC chief executive. The Upper Labayat hydropower plant's renewable-power output through a 2.5-kilometer transmission line is expected to qualify for Feed-in-Tariff (FiT) incentives and get dispatched in the electricity spot market at P5.90 per kilowatt hour (Kwh) under the FiT rate for hydro power. The hydro project is in partnership with Frabelle and TSP Marine Group, a giant food and fishing conglomerate that recently ventured into the renewables business through a consortium with Markham Resources to build mini hydroelectric plants covering Luzon and other areas in Mindanao. Frabelle Group's president Francisco Tiu Laurel said the project will not only provide power needs in the local community, but can, one day, supply their own factories and shipyards. "The hydropower project, once constructed, will generate more energy than our own factory requirements and, at the same time, stabilize the energy needs of the communities here," he said referring to the municipality of Real, Quezon, where the project is located. Its current projects include over 100 megawatts (MW) of mini-hydropower projects with a capital cost of over $400 million. REDC has recently acquired three of the Philippines' oldest operating plants, Philippine Power and Development Company which started in 1927. "We will continue to search for more viable mini-hydropower projects and develop more water systems, aiming to be a leader in the renewable energy industry and supporting the United Nations' Sustainable Development Goal 6 (SDG6)," Tiu said. PEHC also invests in community development and livelihood programs through implementation of its social responsibility and nonprofit initiatives. "We are also committed to the preservation of Philippine rain forests. We are coordinating with local authorities to ensure protection of our remaining rain forests from illegal loggers and are implementing tree planting activities," Tiu said. REPOWER Energy Development Corp. has partnered with food and fishing conglomerate Frabelle and TSP Marine Group to embark on a 3-megawatt (MW) run-of-river mini-hydropower plant in Upper Labayat in Quezon province. "This is one of the projects that we’re building to benefit the local community as we will provide clean, reliable, and sustainable energy. This project will directly address the province’s overdependence on coal power plants as its primary energy source," said Repower Chief Executive Officer Dexter Y. Tiu in a press release on Monday. The high-pressure hydropower plant station will use water from the Upper Labayat stream and produce power for the community. Its construction period is expected to be about two years. It is set to begin operating in the fourth quarter of 2018. Frabelle President Francisco T. Laurel said the project would not only provide the power needs of the local community but could also supply its own factories and shipyards in the future. "The hydropower project, once constructed, will generate more energy than our own factory requirements and at the same time stabilize the energy needs of the communities here," he said about the project’s location ­ -- the municipality of Real in Quezon. Frabelle recently ventured into the renewable energy business via a consortium with Markham Resources Corp. to build mini-hydroelectric plants that are expected to cater to consumers in Luzon and areas in Mindanao. The mini-hydro facility will be built in the upper cascade of the Labayat River, while the power station will be in Barangay Maragondon in Real. The company said the plant’s installed capacity would generate 16 gigawatt-hours of clean and renewable energy yearly and could supply the power needs of 20,000 households. It described the project as one of its "most efficient" power plants. The company is looking to qualify under the country’s feed-in-tariff scheme and get dispatched in the electricity spot market with a rate of P5.90 per kilowatt-hour. The plant’s output is seen to reach the market through a 2.5-kilometer transmission line. "Environmental mitigation measures such as revitalization of river banks, preservation of grassland along the river and other steps to ensure environmental sustainability around the domain will be taken into account in the construction of the power plant," Mr. Tiu said. Repower expects the facility to last for a hundred years. It has five other mini-hydropower projects in the pipeline in Quezon, one of which is scheduled to break ground next month. Repower Energy Development Corp. (REDC) broke ground for a run-of-river hydropower plant project in Upper Labayat, Quezon Province in partnership with the Frabelle and TSP Marine Group, a giant food and fishing conglomerate which recently ventured into the renewables business through a consortium with Markham Resources to build mini hydroelectric plants that will cover Luzon and other areas in Mindanao. REDC is the mini hydropower business of local investment holding company Pure Energy Holdings Corporation (PEHC). "This is one of the projects that we’re building to benefit the local community as we will provide clean, reliable, and sustainable energy. This project will directly address the province’s overdependence on coal power plants as its primary energy source," REDC chief executive Dexter Y. Tiu said. The high-pressure hydropower plant station will use water from the Upper Labayat River and produce power for the local community. The plant is scheduled to begin operations in the fourth quarter of 2018, after a construction period of about two years. Frabelle Group’s president, Francisco Tiu Laurel, whose company just recently entered into the power industry business, said that the project will not only provide power needs in the local community but can one day supply their own factories and shipyards. "The hydropower project, once constructed, will generate more energy than our own factory requirements and at the same time stabilize the energy needs of the communities," he said. The hydro facility will be built in the upper cascade of the Labayat River, while the power station itself will be built at Barangay Maragondon, Municipality of Real, Quezon. With an installed capacity of 3 megawatts (MW), the power plant will generate over 16 gigawatt (GWh) of clean and renewable energy annually, which is equivalent to the consumption of about 20,000 households. This makes the Upper Labayat mini hydropower plant one of the most efficient power plants constructed by REDC. The Upper Labayat hydropower plant’s renewable power output through a 2.5-kilometer transmission line is expected to qualify for Feed-in-Tariff (FiT) incentives and get dispatched in the electricity spot market at P5.90 per kilowatt-hour (kWh) under the FiT rate for hydropower. Repower Energy Development Corp. and Frabelle and TSP Marine Group broke ground for a run-of-river hydropower plant project with a capacity of 3 megawatts MW, in Upper Labayat, Quezon Province. "This is one of the projects that we’re building to benefit the local community as we will provide clean, reliable, and sustainable energy. This project will directly address the province’s over-dependence on coal power plants as its primary energy source," Dexter Y. Tiu, CEO of REDC, said in a statement on Tuesday. The hydro facility will be constructed in the upper cascade of the Labayat River, while the power station will be built in Barangay Maragondon, Real, Quezon. "The hydropower project, once constructed, will generate more energy than our own factory requirements and at the same time stabilize the energy needs of the communities here," Francisco Tiu Laurel, president of Frabelle Group, said. The plant is expected to operate in the fourth quarter of 2018. "The power plant will generate over 16 gigawatts of clean and renewable energy annually, which is equivalent to the consumption of around 20,000 households," Repower and Frabelle Group noted. The renewable power output is expected to qualify for feed-in-tariff (FIT) incentives and get dispatched in the electricity spot market at P5.90 per kilowatt hour under the FIT rate for hydro power. FIT is an energy supply policy that promotes investment acceleration in renewable energy. Repower is the mini hydropower business of Pure Energy Holdings Corp.
Frabelle and TSP Marine Group is a food and fishing company that diversified in renewable business. MANILA, Philippines - Local investment holding firm Pure Energy Holdings Corp. (PEHC) has committed to put up low-impact renewable energy and gravitational designed bulk water supply plants across the country to help mitigate water risks and meet the targets of the Philippines for sustainable development, especially in the midst of the El Niño phenomenon. PEHC CEO Dexter Tiu said the country lacks a cohesive and sustainable blueprint to overcome the looming threat of severe water shortage by 2040, according to a study by World Resources Institute (WRI). "We need to address today’s water problems by investing in renewables and engaging in studies for water use especially at local and national levels," he said. Through its subsidiary, Tubig Pilipinas, PEHC provides clean and sustainable potable water supply across major cities and towns in Luzon, Visayas and Mindanao. It has several water systems and projects in development in Trece Martires, Sual, Labrador, Cadiz, Bacolod, several around the One Negros region and in Mindanao. The firm implemented run-of-river hydroelectric power plants as an alternative to traditional dam facilities to ensure lesser impact on freshwater dependency, carbon dioxide emission and aquatic ecosystem. "In servicing potable water and clean energy in the Philippines, our technology does not destroy waterways nor disrupt the natural flow of water," Tiu said. REDC has recently acquired three of the Philippines’ oldest operating plants, Philippine Power and Development Company which started in 1927. "We will continue to search for more viable mini-hydropower projects and develop more water systems, aiming to be a leader in the renewable energy industry and supporting the United Nations’ Sustainable Development Goal 6 (SDG6)," Tiu said. Metro Manila (CNN Philippines) - In addition to higher water rates and LPG prices this April, power distributor Meralco announced on Wednesday (April 6) that power rates will increase by P0.22/kWh (per kilowatt-hour) this month. This means a typical household consuming 200 kWh can expect an additional P44 to their electricity bill. According to Meralco, the increase in generation charge was caused by higher charges from the Wholesale Electricity Spot Market (WESM), which went up by P2.23/kWh. Peak demand in the Luzon Grid increased by more than 500 megawatts from February to March with the approach of summer. Meanwhile, the FIT-All will start to reflect a higher charge of P0.12/kWh beginning April, in compliance with the provisional approval issued by the Energy Regulatory Commission (ERC) last February. "Costs of energy sourced from the Power Supply Agreements (PSAs) and Independent Power Producers (IPPs) registered slight reductions of P0.02 and P0.01/kWh, respectively," Meralco said in a statement. "These reductions in the PSA and IPP charges were mainly due to the higher dispatch of a number of plants under them, along with the appreciation of the peso in March." Other bill adjustments this April include a slight increase of P0.01/kWh for the transmission charge and an increase of P0.03/kWh for taxes and other charges. Meralco reiterated that it does not earn from the pass-through charges, such as the generation and transmission charges, which go to power suppliers and to the National Grid Corporation of the Philippines (NGCP). The power distributor decreased rates in March because of a lower generation charge, and to a lesser extent, the lower cost of fuel. Last month, Meralco spokesperson Joe Zaldariagga that power rates may go up this summer. Unplug appliances that are not in use, as appliances in standby mode still consume electricity. Keep appliances clean and properly maintained to ensure they work efficiently - poorly maintained and dirty appliances consume more electricity. When buying new lights and appliances, it may be a good idea to consider the LED and inverter types. They might be more expensive, but they are more energy-efficient, and will ensure significant savings on electricity costs in the long run.